Buildings use vast amounts of materials and energy throughout their entire life cycle: from design, construction, operation, maintenance, and renovation through to eventual demolition. Constructing environmentally friendly buildings is often a bit more expensive initially but the investment can pay for itself quickly. Over the life of the building there can be many benefits such as decreased energy bills, higher rental incomes, higher sale prices and higher occupancy rates. As most of us spend close to 90% on average of our time indoors and as green buildings can have healthier, cleaner indoor environmental quality and can be more pleasant to be in, the occupants of green buildings are often more satisfied and more productive. – Design green from the beginning: The design team should seek to minimize the total environmental impact associated with all life-cycle stages of the building project from the outset. This should inform all of their design decisions. – Reuse of existing buildings: Instead of building an entirely new building, it is often more environmentally responsible to renovate and/or extend an existing building. Older buildings can be made more energy efficient and modified for contemporary lifestyles. – Not contribute to sprawl: We should site our urban buildings so that there is less of a need to expand the city into rural areas. This involves constructing more new building in or close to the city centre. As much as possible, we should be building on brown field sites (land previously built on) instead of on green field land that could be used for food growing, etc. Ideally, buildings would be located near public transport so users have alternatives to the car. – Build to a more modest scale: Every building should be as small as needed so as to minimise the use of materials and energy. In addition, as buildings account for a large amount of land use we need to minimise the footprints of our buildings and so save land for other uses. – Use solar energy: Useful free light and heat energy from the sun can be collected, stored and distributed within new and many existing buildings. For example, larger windows can be placed on the south-facing part of a building and a building can orientated to face south so as to take advantage of this free natural light and heat and lessen the need for electric lighting or heating during the day. – Energy efficient building fabric: All elements of the external building fabric (walls, floors, roofs, windows and doors) should be well insulated and airtight. – Eco-friendly building materials: The choice of materials can significantly affect the environmental impact of a building. Concrete and most metals such as steel require large amounts of energy to produce and transport (and therefore have a high embodied energy). Materials such as concrete and steel are also finite resources. Materials that are considered greener are non-toxic, less toxic, reusable, renewable, and/or recyclable. Greener options include: timber (ideally FSC certified), strawbale, hempcrete (mixture of hemp and lime), limecrete, lime rendering, cob, bamboo, recycled metals (copper, aluminium, etc. ), sheep’s wool insulation, cellulose (recycled newspaper) insulation, and reclaimed materials (old timber flooring, etc.). If concrete is required, concrete made with GGBS (ground granulated blastfurnace slag) cement has a far lower CO2 footprint compared to Ordinary Portland Cement. – Reclaimed materials, fixtures and fittings: Instead of using new materials, it is greener to use materials salvaged from another building. Likewise, reused fixtures and fittings are preferable to new ones. – Local materials: Building materials are typically heavy so the environmental impact of sourcing materials locally is often lower than materials that had to be transported great distances. – Minimise construction waste: We need to reduce the waste of energy, water and materials used during construction. During the construction phase, we should reduce the amount of material going to landfills or being burned onsite. Unused materials should be reused on another site or recycled. – Incorporate renewable energy systems: Energy for use within the building itself or energy to be used elsewhere can be generated on-site. There are many technologies including: solar thermal panels, photovoltaic panels, small-scale wind power, biomass and heat pumps. See Energy chapter for further information. – Green roofs: A green or living roof is a roof of a building that is partially or completely covered with vegetation such as grasses, sedum, mosses or other plants. Green roofs serve several purposes such as creating a habitat for wildlife, providing a more aesthetically pleasing landscape, absorbing rainwater, providing insulation, and helping to improve air quality by absorbing pollution. 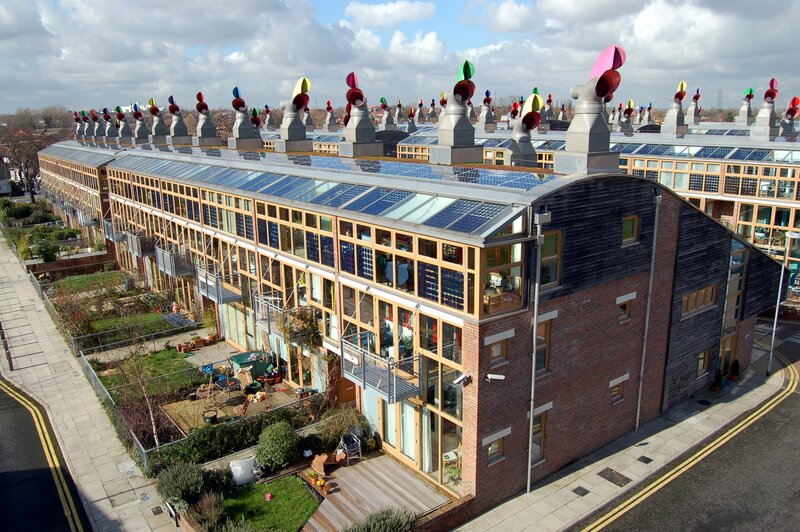 Rooftops on new buildings built in commercial zones in France must either be partially covered in plants or solar panels – a similar law could be introduced in Galway. – Compost and recycling facilities: Well-designed buildings help reduce the amount of waste generated by the occupants as well, by providing on-site solutions such as compost bins and recycling facilities to reduce matter going to landfills and/or incineration. – Energy efficient appliances: Installing energy efficient appliances (such as low energy fridges, TVs, washing machines, light bulbs, dishwashers, computers) not only reduces the impact on the planet but also results in large savings in electricity costs. – Good indoor air quality: The indoor air quality is crucial to the comfort, well-being, and productivity of occupants, especially since most of us spend the vast majority of our time inside. Choosing construction materials, interior finish products and cleaning/maintenance products with zero or low VOCs (volatile organic compounds) emissions will improve the indoor air quality. Some VOCs are dangerous to human health or cause harm to the environment. Harmful VOCs typically are not acutely toxic, but have compounding long-term health effects. Care must be taken to choose adhesives, sealants, paints and coatings that are low VOC or VOC-free. Also important to indoor air quality is the control of moisture accumulation (dampness) leading to mould growth. – Sustainable Drainage Systems (SUDS): As urban areas have expanded greater areas of vegetation (fields, woodlands, etc.) that were once able to absorb large quantities of rainwater have been replaced by impermeable concrete, tarmac and roof. In built up areas during wet weather the rainwater falling on roads, paths and roofs is directed into drainage systems that often overload and cause flooding. The idea behind SUDS is to try to replicate natural systems that use cost effective solutions with low environmental impact to drain away dirty and surface water run-off through collection, storage, and cleaning before allowing it to be released slowly back into the environment, such as into water courses. There will be a greater need for SUDS in the future as climate change will mean that winters are predicted to be wetter and so have more rainfall. – Efficient operation and maintenance: So as to minimise the ecological footprint of a building it is vital that it is operated and maintained properly throughout its life. In large buildings, there are often specialised personnel responsible for the optimum running and maintenance of the building and ensuring as little waste as possible. In our homes, it is up to occupants and owners to ensure that houses are run efficiently. Everyone who needs it should have the appropriate knowledge to use the building as efficiently as possible. – Future adaptability and disassembly: Extending the useful life of a structure reduces waste but when existing buildings reach the end of their useful life, they are typically demolished and hauled to landfills. This is highly wasteful. We should do more to encourage maximum reclamation of building materials. We can go a step further for new buildings. New buildings should be designed for future adaptability and disassembly. Decisions at design stage can allow a building be flexible enough to be easily reused and extended in the future. Buildings should be designed and built so that they are also easily deconstructed at the end of their life allowing materials to be harvested and reclaimed into useful construction material in other buildings.